To Embed a Landing Page into your website, add the below code to your already styled “Chat Button” inside of your webpage. By default, if you place this code into your website without any styling, it will appear as plain text with the word (chat) in the form of a hyperlink. Companyname: Replace ‘companyname’ in the URL with how it appears in the admin’s signup email address. For ex: name@domain.com. Domain will be the company’s name. Make sure no spaces are in the companyname. Hyphens are accepted. Pagename: Replace ‘Pagename’ in the URL with the name of the page that was created inside the page tab of the admin dashboard. By default, we have created a “Demo” page when the WebChat account was first setup. 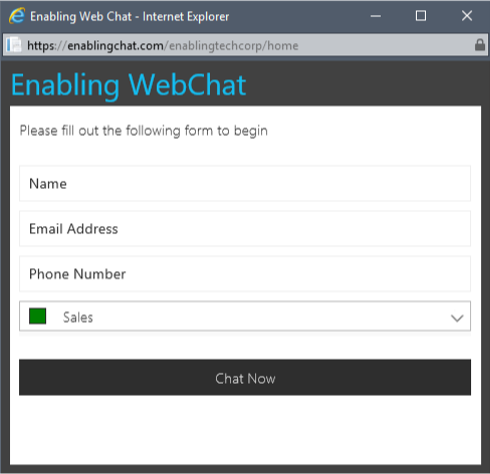 You can access that page by going to https://enablingchat.com/companyname/Demo . Resizing the Chat Request Form: This code utilizes a little bit of Java Script in order to resize the Chat Request Form. The Chat Request Form is the browser chat window that open to web visitor when the link is clicked. By default, our code will hide the toolbar, directories, status, menu bar, and scroll bars from the chat browser window. It will also open the window to the default setting in the code width = 540 and Height = 455. You can change the width and height to your desired settings.